Available in white, yellow, red, black alkyd, and blue alkyd. Can be used on asphalt, concrete, and brick-paved areas. For lines that go on neat and won’t “bleach out” in the sun, give chlorinated rubber paint a try! 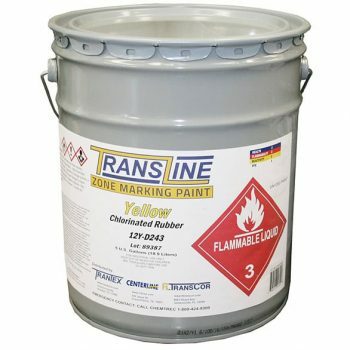 Chlorinated rubber paint by Transline is a high-quality traffic marking paint that’s available at competitive pricing. It’s suitable for use on crosswalks, parking lots, streets, and more. Apply the paint as-is to create vibrant, durable lines, or add glass beads to increase the visibility and reflectively of your newly-made markings even more. Chlorinated rubber paint goes on clean and dries quick. Our paint complies with all state specifications and federal regulations, and we offer various grades of product in order to meet our customers’ unique needs. Chlorinated rubber paint comes in 5 gallon pails and can also be purchased in 110 gallon pallets. At 77°F and 15 mils wet film thickness, chlorinated rubber paint will dry in approximately 15 minutes. For best results, allow paint to dry for a full two hours before exposing to traffic. Please note that exceeding the manufacturer’s recommended film thickness will increase the likelihood of paint—and asphalt—lifting. Do not apply when the ambient temperature of the application site is below 50°F and/or the relative humidity exceeds is 85%. Prior to application, clear the area to be painted of dirt and debris using a standard leaf blower. Power washing or surface abrasion may be necessary if the pavement is stained with large amounts of engine oil or exhibits efflorescence. Loose paint should also be removed prior to application of fresh markings. New, fresh coats of chlorinated rubber paint can be applied directly to steadfast existing lines, but multiple layers are more likely to lift. Chlorinated-Rubber is a solvent based high performance zone marking paint.It offers quick dry times and excellent durability on a wide range of surfaces.